Broken is a personal project featuring a short story written by myself and hand drawn illustrations. It is based on real life events but I have changed names in order to project identities. The story is about how a women succumbs to a controlling partner. How she is manipulated into thinking that they only person who truly loves her is a her partner. She believes that her family have turned against her partner to hurt her not because they are concerned for her and her childrens well being. “Drip, Drip, Drip. That’s how they do it. They don’t push you away from your friends and family straight away. They don’t take away your financial freedom on the second date. They do it slowly, so slowly that you might never notice what you’ve lost. You’ve become accustomed to a life where you are always with your partner and when your not they call you all the time. You automatically check with your partner about every little thing. You don’t think about going out with your friends because you’ve fallen out with them. 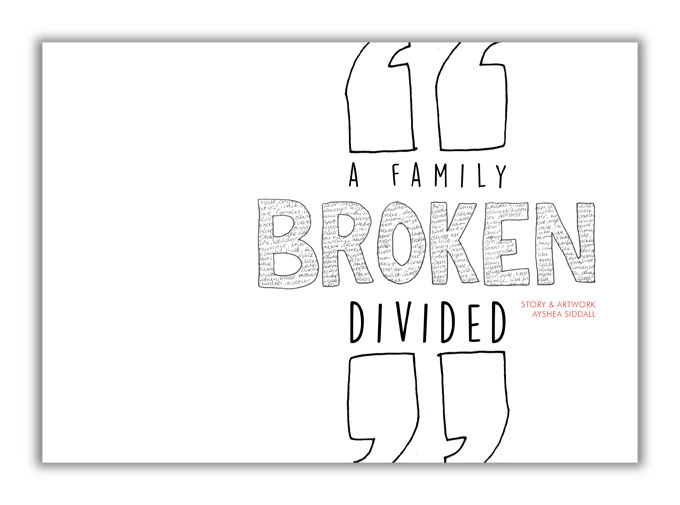 Full PDF of “Broken” here. I wanted to get a across the anger but also the strong feelings of love. I settled on the idea of using hand-drawn typography with traditional digital typography. It felt more personal and alive. With it being something personal (I’m not the abused women in the story but it is someone I know) it was a difficult project to complete. But I’m glad I did it as it gave me the chance to express certain feelings and my creativity. I tried a few different methods for the illustrations. One is hand painted. I have used stencils a few times, paper cut outs and even rolling up paper and using it as a stamp for the spawn. Illustration Materials: Pen, Gouache, Paper, Pencil. Abuse is complicated as it features many aspects and violence is just one of them. Some partners are never violent they rely on other methods such as isolation and controlling finances in order to prevent you from leaving them.